Unique to us in the UK. (Moss) Soft lilac-pink, fragrant, double flowers are borne on a vigorous relaxed shrub with ample, light greyish-green leaves. Flower stalks are long with profuse green mossing around globular buds. Tolerant of poorer soils and the shade, the characteristics of this rose lends itself well to woodland planting. Also ideal if you're trying to create a beautiful area which will provide a habitat for wildlife. Rose of the year 2010. (Floribunda) Large clusters of repeat flowering, butter yellow blooms with an unusual myrrh scent. This Award winning rose is very healthy and free flowering. An ideal specimen for the garden or for growing in a pot where space is limited. If blooms are cut they last well within an arrangement. (Climbing Tea) Very scented, large fully double flowers of buff, amber and apricot, with tints of pink deep in the centre. The repeat flowering blooms when fully open are often quartered and are complemented with large dark green leaves. Said to be the first of the Tea roses. Probably a vigorous bush at introduction but better grown as a climber on a short wall, where it can enjoy protection from the severest weather of winter. (Bourbon) The semi-double, luminous bright pink blooms are abundantly produced in fragrant, clusters throughout the season. The shrub is upright and well foliated. With age the flowers will fade to a soft but still pleasing pink a variety that deserves more attention. Tolerant of poorer soils and good for cutting. (Sempervirens Rambler) Clusters of small, shapely, semi-double, powder pink to creamy white flowers cascading in profusion from a well foliated, evergreen climber. Vigorous in a rather refined way, this fragrant rambler is ideal for growing into trees. 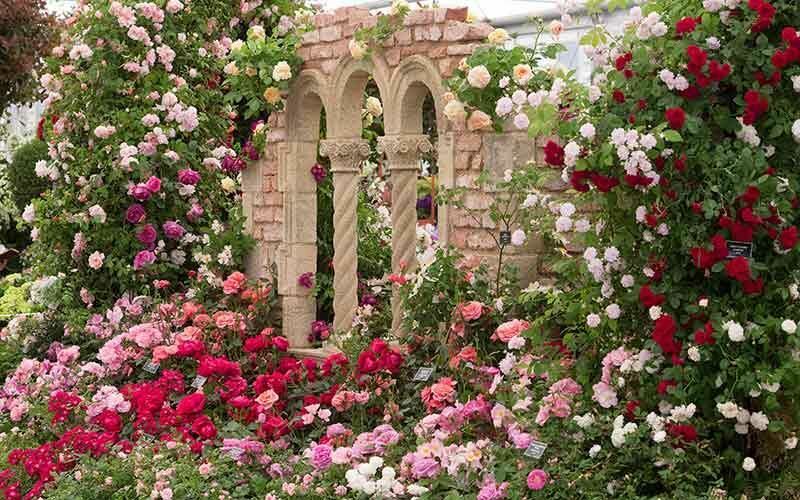 with training it would also make a delightful hedging rose. (Gallica) This rose is highly scented, pale pink with a deeper centre. When fully open the irregular petals form a loose quartered effect reminiscent of crumpled crepe paper. Although somewhat taller, this charming rose is probably related to the lovely Gallica 'Empress Josephine'. With densely arching growth, the leaves are soft to the touch, yet quite crisp in texture. Unique to us in the UK. (Gallica) Clusters of medium sized, highly scented, fully double, soft pink blooms. Foliage is greyish-green and soft to the touch. Growth is dense and slightly arching so lends itself well for growing as a hedge. (Multiflora rambler) 'Yellow Rambler' Clusters of semi-double, medium sized flowers in shades of yellow paling to cream. Growth is upright and stems are almost thornless. Foliage is bright light green with bronzy tints, especially when young. A significant rose as it was on of the varieties initially used by Pemberton in breeding his race of Hybrid Musks. (Rugosa). One of the few yellows within this family. A vigorous plant with spreading branches bearing, amber-yellow blooms which are about 3 inches across, fully double and scented. This rose shows its parentage in its dark green crinkled foliage and finely prickled stems. A very useful rose where a yellow shade of the Rugosa type is desired. Ideal for growing as a hedge. (Gallica) With large crimson, smudged purple 2 1/2 - 3 inch flowers of semi-single form. The very pronounced golden stamens are a magnet to wildlife. Tolerant of shade and highly fragrant this leser known Galllica produces a dense and bushy growth with dark green foliage. (Alba) 'Jacobite Rose','White Rose of York'. Beautiful very fragrant, rather muddled double blooms, wihich are white with creamy tinted centers. Complemented with leaden-green leaves this rose sets good autumn fruit if left unprunned. An award winning hardy cultivar. (Alba) Semi-double, sweetly scented, pure white flowers with pronounced anthers borne on an upright but graceful bush. With matt, grey-green leaves and good autumnal fruit this underrated form of 'Rosa x alba' derserves more attention, especially as an informal hedge or a lax shrub in the wilder garden. (Wichurana) Superb glossy foliage produced on long, pliable stems hold, shapley flowers that are slightly scrolled in bud, opening to semi-double, creamy white, flushed lemon-yellow. Very healthy and vigorous, one of the best ramblers.